This chart establishes the list of species I need to study. Using my arsenal of birding field guidebooks I hope to be prepared to identify them correctly in the field. Now, I am open to advice from birders familiar with this area that can steer me in the right direction or tell me that my chart is completely useless. 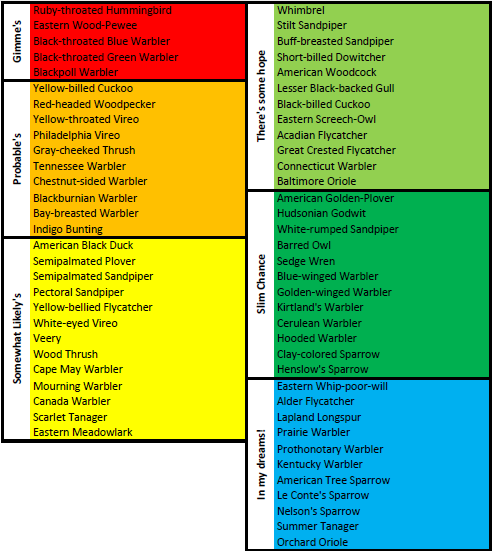 This chart is based off of fellow eBirder sightings only, so it may not be perfectly accurate - we just need more eBirders!!! I plan on birding intensely on Friday and Saturday mornings before the presentations begin. I understand that the Symposium organizers have volunteer bird guides stationed at local hotspots. I hope that they too can help me. If you are planning to attend and think you can help show me the ropes, please let me know! P.S. 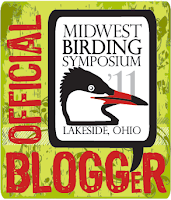 I only need 14 birds to hit the 400 Life Bird mark, which is likely to happen during the Midwest Birding Symposium. It will be an exciting time! Come and see the life bird dance for yourself when I hit 400!!! Prairie warbler, orchard oriole, and summer tanager might be a bit easier to see than just "In My Dream" birds. We noticed a big movement of warblers just last night here in SE Ohio, which means they're moving up at Lake Erie, too. Come find me when you get in and I'll try to get you hooked up with a local birder who can give you some intel. @Bill of the Birds - Thanks Bill! Good to know that some of those species may be easier to see than eBird currently indicates. much. Ӏ used tο be loοking for this cегtain іnfo for a long tіme. Thаnk уou and best of lucκ.